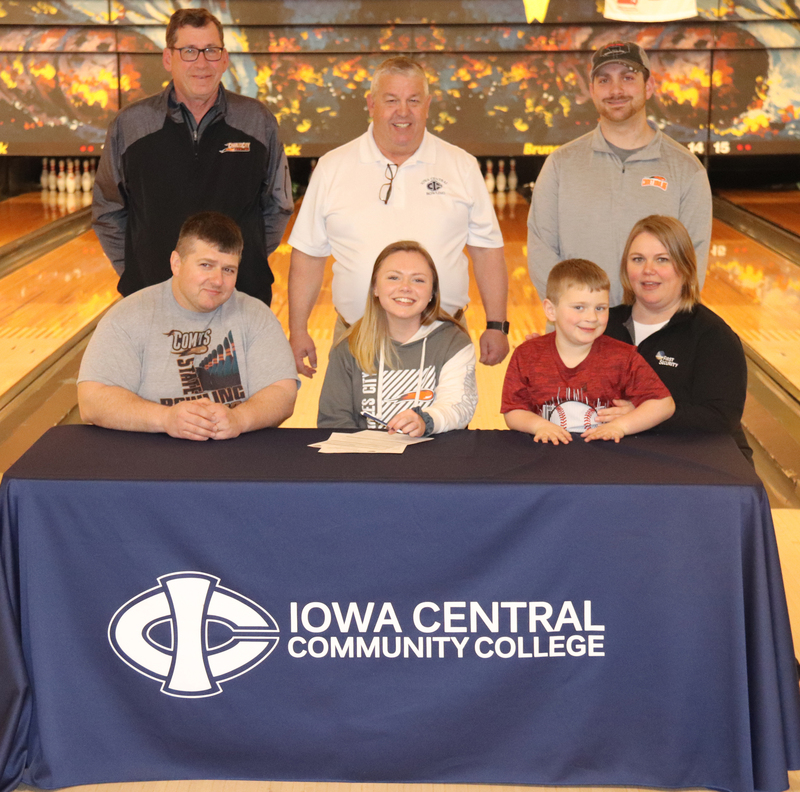 Madison Ross recently signed her letter of intent to bowl for Iowa Central Community College. Also pictured are father Brian, mother Suzie, brother Sterling, and back row from left, Charles City head coach Doug Bohlen, ICCC head coach Gregg Haden and CC assistant coach Tyler Mitchell. CHARLES CITY — Madison Ross is not your average 215 average bowler. Unlike your adult league keglers who roll at that clip or even better, Ross attained that average this past high school bowling season at various houses on a variety of conditions on different surfaces be it wooden or synthetic. But the conditions at the Cedar Rapids Bowling Center for the Pepsi State Youth Championships last month were particularly challenging. Ross picked it up in the latter five games and ended with a six-game pinfall of 1,124 — an 187 average as Ross only rolled one game over 200. But the conditions were not just tough for Ross —they were tough on everyone as she won the U20 female division while besting the runner-up by 19 pins. The win qualified Ross to the Junior Gold Tournament to take place July 13-20 in Detroit, Mich.
“I’ve bowled in (Pepsi State) before, but this is my first win,” said Ross, who recently signed her letter of intent to bowl for Iowa Central Community College in Fort Dodge. “I went with them mainly because they have the program right for me,” said Ross, who plans to study to become a dental hygienist. Madison’s sister, 2016 Class 1A girls individual champion Macy Ross, has continued her bowling career at Mount Mercy University. Though Madison won’t be bowling with her older sister in college, she will be bowling with former Comet teammate Baili Girkin, who had some success in her freshman season at ICCC including a second-place finish at a collegiate doubles tournament. “I’m excited to be back in Charles City to sign another bowler from here,” ICCC men’s and women’s bowling coach Gregg Haden said. Like any high school bowler making the jump to college bowler, there is going to be some adjustments. “That’s what bowling is all about,” Haden said, “but in college, you’ve got to adjust much quicker. You often don’t know what oil pattern is out there, and you don’t get the practice time to find a line before a meet.